The 10th anniversary tribute to the outrigger canoe Hokule'a at the Waikiki Shell this weekend will reflect both ancient and modern modes of travel. The public will have all day Saturday at Sans Souci beach in Waikiki to meet crewmembers and tour the famous canoe that has sailed more than 100,000 miles throughout Polynesia and the U.S. West Coast. » Time: 4 p.m. Saturday; concert at 6 p.m. 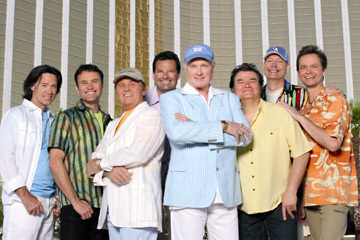 The Beach Boys, on the other hand, will arrive in Honolulu to headline the benefit concert for the Polynesian Voyaging Society with the help of a private jet. Beach Boy Bruce Johnston, speaking by phone from a San Diego tour stop last Friday, told of the band's busy travel plans. "We'll be on 'Good Morning America' as part of its summer concert series, at 7 a.m. in New York City, then fly 10-1/2 hours to Honolulu, play Saturday night and then fly back to California the following day." Don't feel too bad for Johnston and company, though. It's all part of being a classic rock 'n' roll band, with a yearly tour itinerary that has included well-paying private convention concerts throughout Hawaii. Johnston -- who turned 64 June 27 -- initially replaced Glen Campbell (who, in turn, was filling in for a then-ailing Brian Wilson), and is proud to say that one of his first recordings with the Boys was "California Girls." He's been enjoying a new lease on life following a heart bypass. "I'm a surf guy still to this day, so I made sure I asked my doctor if I will be able to surf again, and he said absolutely. "On the ninth week after the surgery, I was back on the road, in England, doing 15 2-1/2 hour shows in 15 days. I recovered beautifully. Of course I learned that, even though you feel you're invincible, you're not, but you can recover from such a thing." Johnston has given up alcohol and eating meat, and makes it a point to exercise while on the road. This day, he measured out two miles while walking the floors of his hotel. He keeps in shape musically, as well. "We try to sing the songs with the same harmonies and in the keys of the original recordings. ... It's like being in a symphony. It's always about playing the arrangements, the strict parts that you have to adhere to. "Thankfully, the guys in the band -- some of them who have been with us since 1968 -- love the music. Brian's music came out fabulous and Mike (Love's) words are always fantastic. It's all about depth, balance and having good fun." Love will soon release "a cool solo album," and Johnson said he's returning to songwriting, working on movie and TV projects. (One of his most memorable Beach Boys tunes was the sweet-sounding "Disney Girls" of '71.) "I put the writing on hold for a long time, but I wasn't going to let it fade away." The Hokule'a celebration will also include Amy Hanaiali'i Gilliom and Lehua Heine, singing "Sail On Hokule'a" with the children of Halau Hula 'Olana. Leina'ala Kalama Heine, Randle Fong and Merrie Monarch Festival winners Kaleo Trinidad and his halau, Ka Leo O Lake I Ka Hikina O Ka La, will also be special guests. The singers will be backed by a specially collected band of musicians led by Ken Makuakane, dubbing themselves Voyage. A special CD, "Hokule'a: The Legacy," will be sold by Bishop Museum, a portion of the proceeds going to the voyaging society. 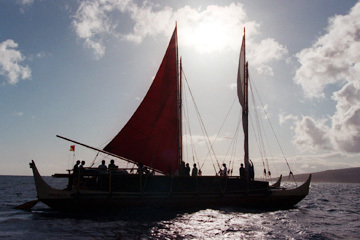 The tribute will end with the auction of a sail from the outrigger canoe and an original painting of the Hokule'a by Herb Kawainui Kane, co-founder of the voyaging society and a canoe designer. Society Chairman Nainoa Thompson said the board wanted "to take a single evening to create memories and acknowledge the genesis of Hokule'a." "It was a difficult decade, the 1970s, when the Hokule'a was first conceived," Thompson said. "It was about new learning, and thankfully there were individuals who had the commitment and strength to meet those challenges. So we're taking a moment to reflect and remember not only our mentors, but to honor the first crew who took a deep-sea canoe on a voyage across the Pacific for the first time in 600 years. "It was a very powerful journey of learning traditional values." A new CD, "The Beach Boys, Songs from Here & Back" is available exclusively at Mark's Hallmark Shop locations in Kahala Mall, Pearlridge Center and Windward Mall. It includes previously unreleased live performances of the band's classic hits, as well as three new studio-recorded songs.